United Launch Alliance has partnered with Orbital Sciences to provide launch services for the transportation of cargo to the International Space Station as part of NASA‘s Commercial Resupply Services program. ULA said Tuesday the agreement includes one cargo mission that will launch late next year from Cape Canaveral Air Force Station with the Atlas V 401 vehicle as well as an optional mission in 2016. Jim Sponnick, vice president for Atlas and Delta programs at ULA, noted that the program will launch Orbital’s Cygnus cargo delivery spacecraft into space. 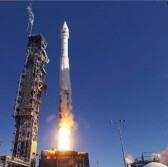 ULA said that it has launched 90 satellites to support weather, navigation and military operations.